Kvetch Clown Theater&Dance Company is a sister run performance company dedicated to accessible, connective and interactive performance. Recycled is a work in progress based in improvisational red nose clown. It explores feelings in response to the state of our world and the possibility of choosing connection and creativity despite. ​an open improv jam and short experimental performance. 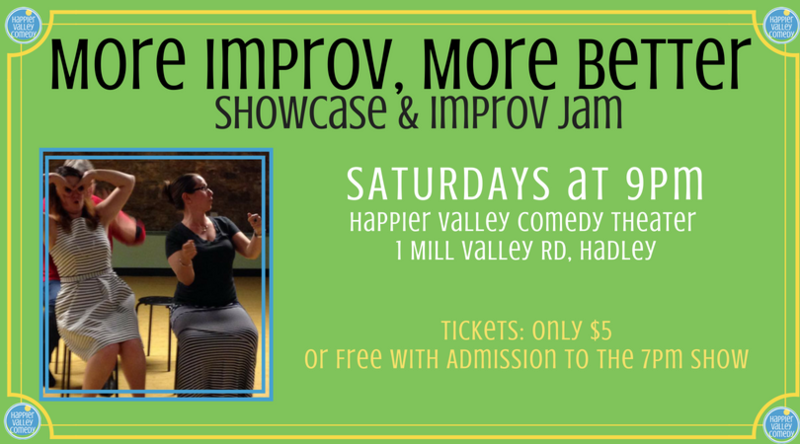 Play improv games lead by a Happier Valley Comedy Jam Leader and watch a short set featuring a student group, up-and-coming performers, indie troupe, or experimental format. "More Improv, More Better" is our community-based event where we provide time, space and applause for budding performers to spread their comedy wings. ​You never know what you might see! ​You definitely know you'll be invited to play! Come watch. Come play. Come laugh. upcoming "more improv, more better"
APRIL 20TH - Kvetch Clown Co.
**Would you like to showcase your group or new form? Email Scott! Check out all of our other shows! "This session includes improv games lead by a Happier Valley Comedy School instructor and a short, improvised set featuring select advanced improv student teams. It's a good way to get your feet wet in improv, if such a thing tickles your fancy."